In my yearly struggle to avoid thinking about the idiocy of the Oscars, I invariably fail when I fall in love with one of the brilliant shorts that is doomed to not win due to the pedestrian tastes of the majority of the Academy. This year will be particularly traumatic in the “Best Animated Short” category. Pixar’s really good Sanjay’s Super Team (Sanjay Patel, 2015) will clearly win. But, despite the genius of many things Pixar, the best film I’ve seen this year, animated or otherwise, is its primary competition, a Chilean film simply and deceptively entitled, A Bear Story. 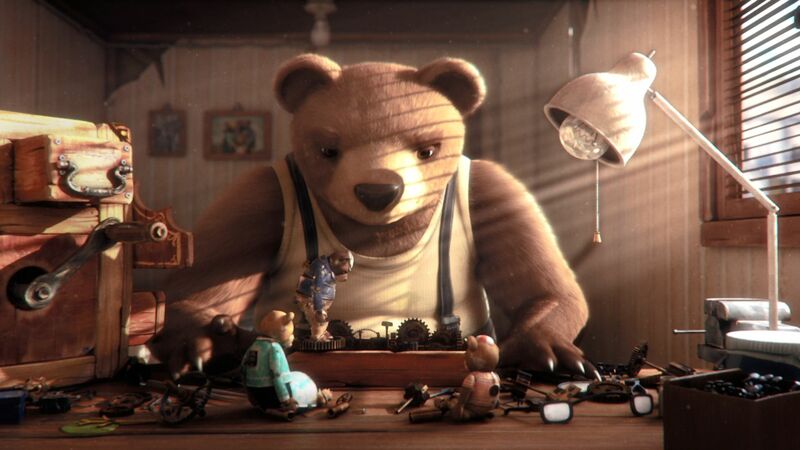 Gabriel Osorio’s fifteen minute 3D CGI film begins with an intense sequence in which an aged male bear, solitary and silent, toils away at his desk repairing little mechanical figurines, parts for an elaborate machine. After he finishes his work, he leaves his empty apartment and brings his cart to a street corner. A child gets a coin from a parent, and approaches our bear. He begins cranking his machine, which suspiciously resembles a Kinetoscope, Edison’s peep show machine that drove the early years of cinema development in the 1890s. Simulating the child’s interest, the camera tracks forward and we suddenly enter a different diorama world of images. A string of robotic thugs chase the figurine version of our bear into an apartment. In front of his wife and child, the gangsters beat the bear and drag him off to a circus. At this moment, the film’s allegorical project is revealed: the bear is one of the “disappeared,” the Chileans dragged from their families during Pinochet’s dictatorial regime in the 1970s. Indeed, biographically, the bear is based on stories Osorio heard of his grandfather, one of the disappeared. It is a horrifying moment, every bit as poignant as the great classical Hollywood Disney traumas, such as the murder of Bambi’s mother or the transformation of the boys into donkeys in Pinocchio (1940). What distinguishes A Bear Story from other such wonderful allegorical animated films is its precise reconstruction of both animated and live action film history. On the animation front, the trauma initiates an elaborate reconstruction of Dumbo (Walt Disney, 1941). Our bear is imprisoned not in a Chilean prison, but a circus. As he rides in a train car, jailed by metallic bars, he most resembles Mrs. Jumbo, Dumbo’s mom forced apart from her son for violently protecting him from mocking humans. However, at least Mrs. Jumbo gets her film’s best sequence: she cradles her son in her trunk through the bars, as we listen to the most moving song in the history of animation, “Baby Mine.” Our bear gets no aesthetic salve for his pain: he never gets to see his family again. However, A Bear Story has its best trick in store for us. Our bear uses his skills as an artist to produce an aesthetic redemption, one unavailable to brutalized Chile. To uncover how this works, we need a turn toward live-action film history. When the thugs arrive to beat the bear, his wife and child retreat into a room to the left of their living room, listening in horror. The sequence invokes, of all things, D.W. Griffith’s The Lonely Villa (1909), a last-minute rescue film made at Biograph. A husband goes to work, leaving his wife and daughters in an isolated cottage. Tramps arrive and attack the family. As the husband rushes back home, first with car and then with horse, the family keeps retreating screen right into a series of inner rooms. The wife buys her family just enough time for her husband and the police to enter the last chamber just as the tramps do. Griffith’s last-minute rescues are the foundations of the Hollywood happy ending, commonly reduced to melodramatic simplicity. But A Bear Story invokes The Lonely Villa in mirror image—the wife and cub retreat to a room screen left—in order to redeem this type of ending. Within the diorama, the bear artist has in fact chosen the path of Griffith for himself. He miraculously escapes from the circus, and reunites with his wife and child, hugging them exactly as the husband embraces his family at the end of The Lonely Villa. That is to say, A Bear Story has a happy ending, one only available to the bears within the artist’s cinema machine, but of course also available to us in our cinema, watching from one level higher. The ending of A Bear Story explores this dichotomy of the bittersweet with an exquisite denouement. The child leaves the diorama presentation, holding the parent’s hand as they walk away from our bear. In close-up, the artist seems grumpy with his dour bear face. We begin to think he is enraged at his inability to hold the hand of his own child. However, an almost imperceptible wry smile comes to his visage in the middle of the shot, as he continues to watch the family walk away from him. The film ends with the triumph of art, delight that his willful decision to create rather than destroy has brought joy to the little child. And thus, the animal bear—who has every right to want to wreak apocalypse upon his fellow beings—becomes the human artist, who creates in order to bring joy to a world that so desperately needs it. A Bear Story is a truly great film. By drawing from the heart of the conventional—Disney and Griffith being the founding fathers of not only cinema, but also American imperial dominance over global culture—Osorio’s film is able to redeem not just the bear. Amid the Leftist Chilean revolution so brutally crushed by Pinochet’s thugs, Ariel Dorfman and Armand Mattelart wrote one of the great comic books of all time, How To Read Donald Duck (1971), a Marxist indictment of the capitalist propaganda spewed in Disney comic books distributed in Latin America. A Bear Story uses the master’s tools to dismantle the master’s house: the Griffith last-minute rescue is hijacked for the purposes of the disappeared, creating an animated fantasy where he strictures of American imperialism cannot penetrate. It is a world of political justice that Disney and Griffith failed to find—indeed, which they would never even have looked for—but one into which Osorio and his wryly grinning bear welcome us.